PLEASE CHOOSE THE STOLE COLOUR YOU REQUIRE AT CHECKOUT AND ADD THIS INFORMATION TO THE COMMENTS BOX. IF NO COLOUR IS GIVEN THEN WE WILL SEND THE STANDARD GOLD STOLE. 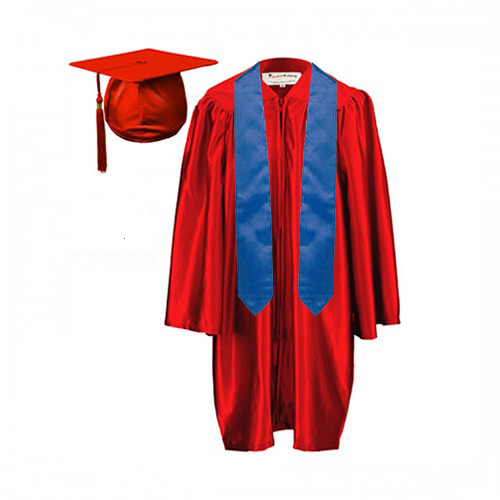 Our graduation gown and stole sets are designed to fit a variety of styles and budgets, so you can create the perfect event for your children and parents. Available in a satin finish, each graduation set includes, gown, stole, hat and matching tassel with year tag. Our standard colours are Red, Royal Blue, Black, Purple and Burgundy. Please call if the colour you require is not listed. Non-standard colours can take 6 to 10 weeks from receipt of order.